First What I Ate Wednesday of the year! I know how much you guys love these...and truthfully I really like doing them because I love seeing what other people eat in a day - I don't know why but somehow it's fascinating?! So I definitely plan to keep these posts up in 2017. 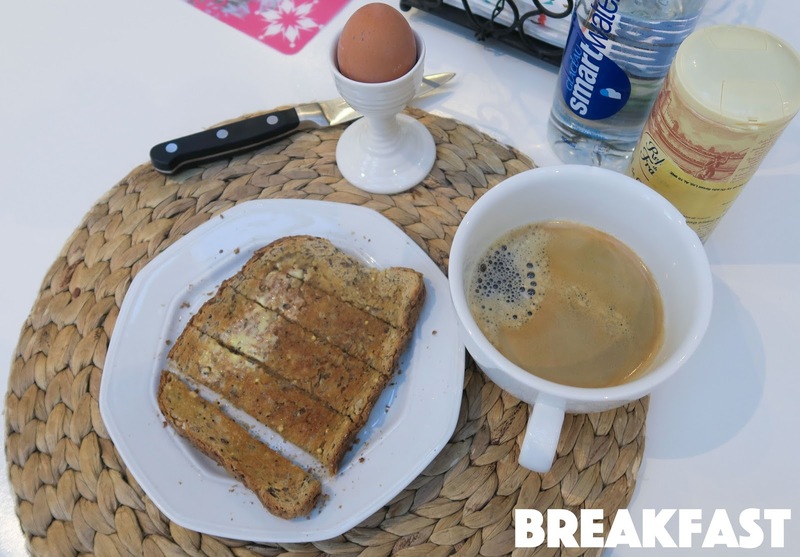 Anyway, for breakfast this morning I had a soft boiled egg, a slice of multiseed toast with butter, a black coffee and bottle of water. I always add salt to my boiled egg too (just a little, but it makes all the difference!). 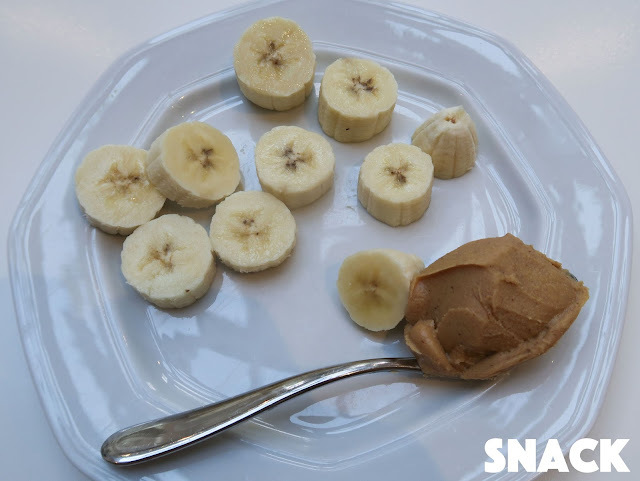 Mid morning I had a quick snack of a tiny banana (hahaha...not by choice! But that's what you get sometimes with organic fruit) and spoonful of peanut butter (my fave!). We went to Bluewater Shopping Centre to do some baby shopping and by the time we arrived it was lunchtime. So we eventually settled on Wahaca for lunch (after attempting to queue at about 5 different restaurants) which does amazing Mexican food. 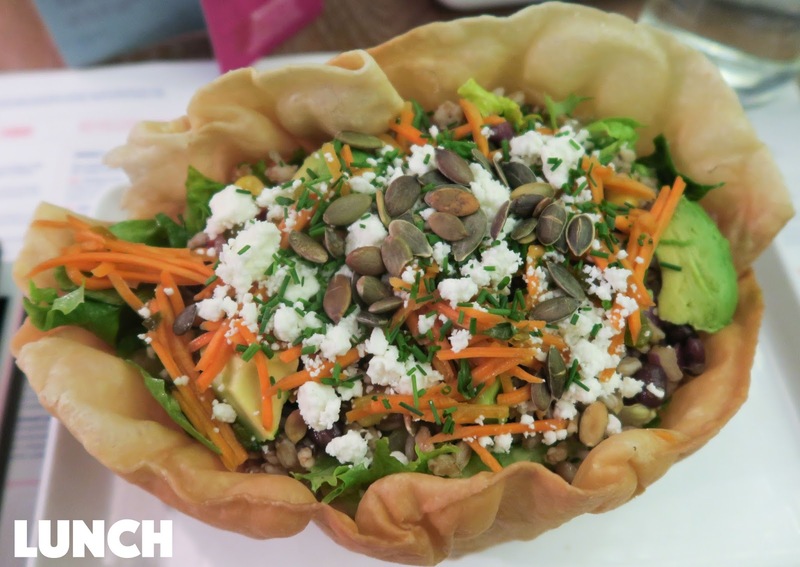 My favourite is the supercharge salad which contains avocado, feta cheese, pumpkin seeds, bulgur wheat and grated carrot and is served in a tortilla bowl (which I always eat...even though it's probably not very healthy!). I also shared a big bottle of water with Jonathan. That tortilla bowl filled me up until later in the evening when we got home for dinner. 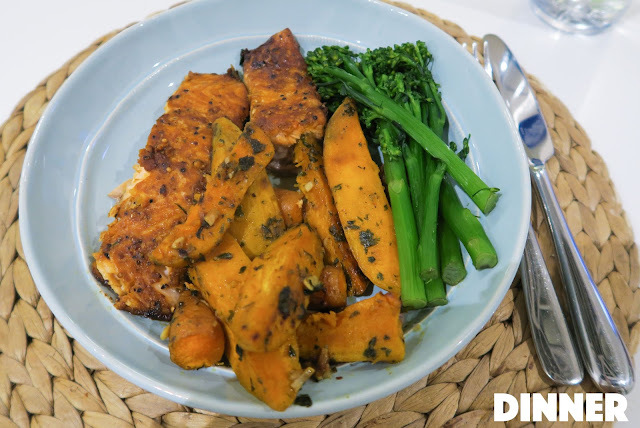 We had baked salmon (one of my favourites and I know I've featured it loads on here before!) with sweet potato, baby carrots and steamed broccoli. The sweet potato and carrots were roasted in the oven with a little olive oil, garlic and parsley. They are sooo good! I also drank another bottle of water with dinner. 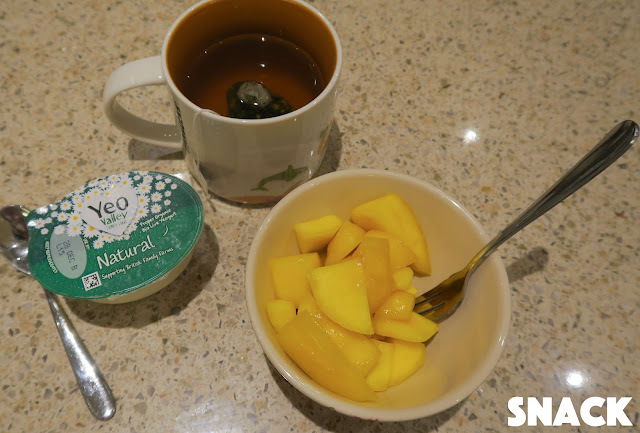 I've been trying to keep it healthy so instead of dessert I had a bowl of chopped mango and (out of date) plain yoghurt with a cup of licorice and peppermint tea. I was actually really craving fruit so this hit the spot! That's all for today - you can check out my video above featuring the whole family plus two crazy dogs and Theo's hilarious antics (Albi and Theo have a love-hate relationship...it's complicated!). Enjoy! Love these posts Anna! I know what you mean - there's something oddly satisfying about reading what other people eat! And now you've made me hungry and there's only fudge in my reach... Dammit! PS: loved the vlog today - 7 months down, it must be getting so exciting! All my love to you, Jonathan, the kiddies and the doggies! Everything you eat always looks so yummy! Love you Anna! Did your salad end up having beans in it?? I love these kinds of posts! I've always loved your WIAW posts and I'm with you, for some reason it's really fascinating seeing what other people eat? I love your blog posts so much and just hope you carry them on forever because they REALLY are my favourite things to read right now. I just really love having a combination of your vlogs and your blog! Good luck for the future Anna! Hi Anna, I've been subscribed to your family youtube channel and following since you were pregnant with Emilia but never subscribed to your blog and i have no idea why! I love it! I have 3 children myself, we just had our 3rd baby in May! She's 7 months old now. My family loves you guys! Take care Anna! ❤ love you! Anna, I have been watching your videos for ages but only just started reading you blogs and I absolutely love them! I completely understand what you mean when you say about liking to read what people eat, I do too! It gives me lots of ideas of what I could eat myself! Anna your such a amazing cook and such a amazing mom. When I have kids I hope that we will have the same relationship as you do with yours. You go out of your way to cook food for you and your family when you could get someone else to do it and I really think that shows who you really are as a person and your character. I just watched your snapchat story about the trolls and Im so proud of someone that I look up to doesn’t let those people affect your life. Hello Anna, I saw on your snapchat that you approve your comments so that they aren't published straight away! Please could you not publish this comment it's just I don't know how else to contact you! I recently wrote you a letter and I sent it to your PO Box and was just hoping that it delivered! This comment is anonymous, because the name/URL didn't work? I love your "What I eat wednesday" posts ! It might seem odd, but I appreciate getting inspiration for meals and snacks. Plus, your pictures are lovely. These posts are my fave! You inspire me so much! Such a perfect combination for the day! Lunch looked gorgeous....avocado just always gets me super excited haha! Love having a little peek at what other people eat, and eating clean is soooo good for your skin and makes you feel so much better in yourself too! omggg i need to find a place in my city ( Montréal by the way you guys should come visit;) ) that sells tortilla bowls it looks so yummy!